the diy cereal box notebook planner i made 2 years ago is still going strong and i’ve been using it all the time! 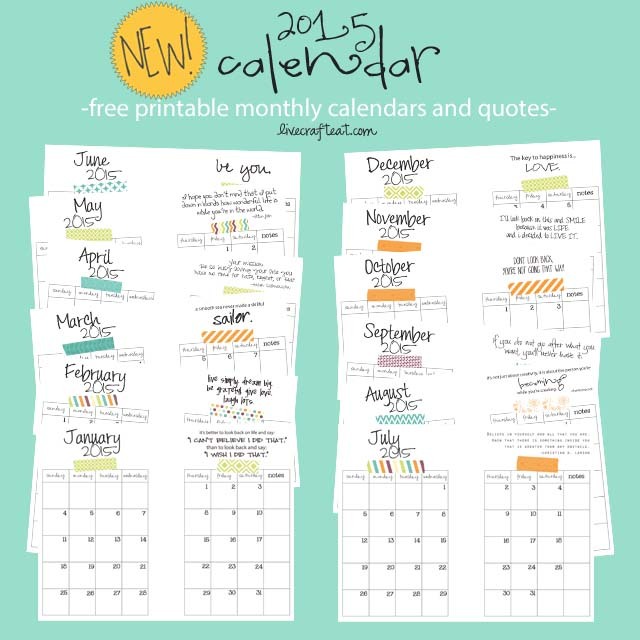 and these freebie monthly calendars still look as cute as ever in it! all you need to do is print onto 8.5″ x 11″ paper or cardstock, cut the page in half, punch holes, and you’re ready to organize! 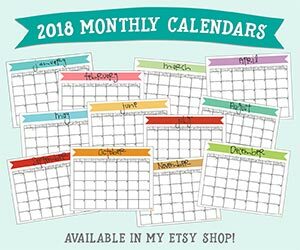 although, if you prefer to not have to make a cereal box planner just to use these monthly calendars, you can always get a mini binder like this one here (i got mine from walmart), and mini page protectors (i use them to hold receipts, or pages i’d like to use dry-erase markers on, etc). 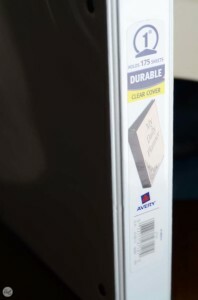 they are meant for this exact size of paper (5.5″ x 8.5″, or roughly A5 size). all you need to do to make the binders personalized for you is cut some scrapbook paper and insert on the outside pockets, front and back, and the binding. the links for the binder and page protectors are affiliate links. 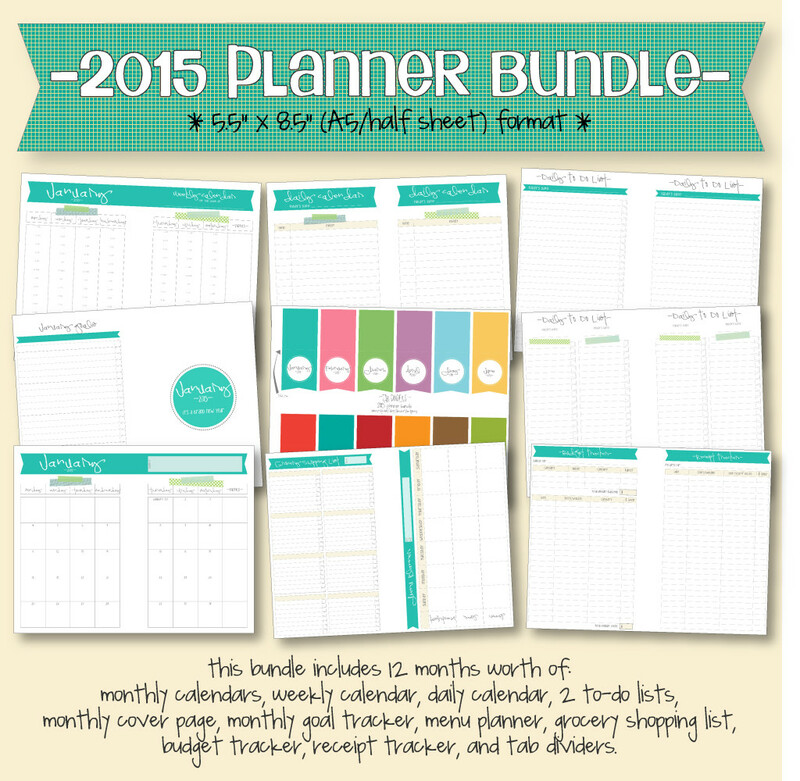 without further ado, here are the printables so you can make your own 2015 planner! have a happy new (and organized!) year! *if you are interested in 2015 planner/calendar bundles, including monthly, weekly, and daily calendars, budget trackers, menu planners, grocery shopping lists, to-do lists, and more, in both half sheet (A5) and full sheet (8.5″x11″) sizes, check out my etsy shop! I’ve downloaded the zipped file but it will not print. I’ve tried it several times with no success. ??? Hi Sharon! So sorry you’re having trouble printing. Each zipped file should have 3 PDF files inside that you should be able to print individually. Do you have Adobe Reader for opening the PDF files? I haven’t heard from anyone else re: having problems printing. Let me know if you still are and I’ll try and help. Hi Katie! I am also having trouble printing 🙁 I was am so excited to use these I have even tried pasting into a word document but it prints a blank page. Thanks in advanced for the help! Thanks for sharing the tip Rachel! I think I only have the adobe reader on my computer, using my work computer since my home printer is on the fritz. Is there no other way to get them to print then from the full client? Splitting them up seems to have done the trick. They will now print out for me. Thanks. Thank you for your wonderful calendars! I enjoy using them very much, they never fail to make me smile. Thank you so much for your nice comment, Joann! 🙂 I’m so glad you like the calendars! I just found these and quickly changed my monthly calendar in my planner, lol! I loved these since I first saw them…thank you so much for offering them free! If you don’t mind, I would like to link to this post in my blog post on my planner. Hi Erica! I’m so glad you like them! Yes, you can absolutely link to my post 🙂 Thanks for asking! Thanks for sharing the calendars. They are really pretty, and although I use my iPad calendar a lot, it’s nice to have something pretty and inspiring to look at. I am late to the party, but so glad I found you!! I had these up last year and loved the quotes. Eventually, I used them as a way to track activities and meals…love the blank space in the middle, even though I don’t use it in a planner. Been too busy, but things are slowing down now, and I finally had time to focus and find you! Bookmarked now. All the best to you and yours. Thanks! yay! 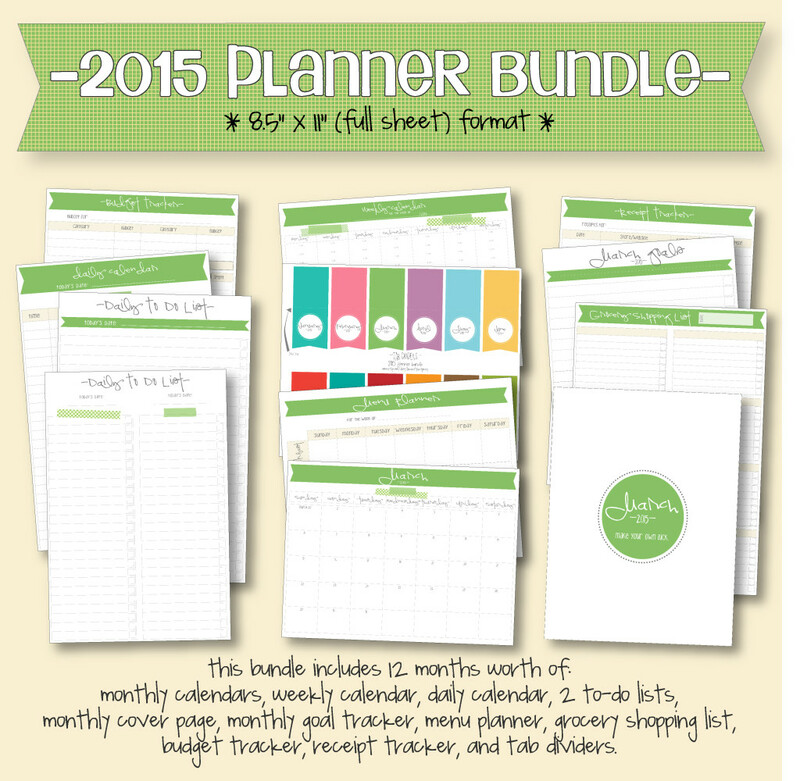 i’m so glad you like the planner and that you found us! 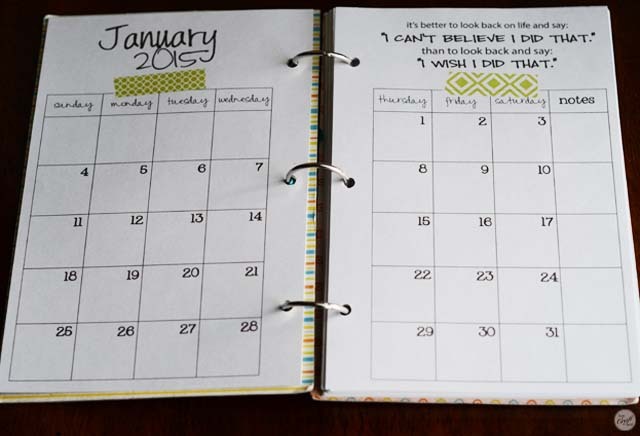 Will you be making these for 2016 as well? Thanks Erica. They probably won’t be up until December sometime. Hopefully between the craziness that is Thanksgiving and Christmas! I have used your 2015 calendar this past year and I love it. I was in a panic because I couldn’t remember what site I got it off of when I happened across your site for a different reason and was so excited to see your calendar. I agree with Shari. I LOVE the A5 monthly split pages that you’ve posted here. I’m definitely looking forward to the 2016 version! Hoping in the next week or two!